In the lead up to the release of Health Canada’s newest Canada Food Guide, people across the country were mired in debates about nutrition, sustainability, and food security. While most of the discourse around the Canada Food Guide might focus on whether fruit juice falls under the “fruits and vegetables” category, it also gives us a chance for a much larger conversation about access to nutritious food for people in poverty. As health expert André Picard wrote in The Globe and Mail, “Healthy eating, as it is proposed in Canada’s Food Guide, is a privilege of wealth.” This leaves us asking: what does the new Food Guide mean for the over five million people living in poverty in Canada (according to the Low-Income Measure), and the roughly 860,000 people who use food banks each month? Take, for instance, the issue of child food insecurity. In Canada, 1 in 6 children in Canada under the age of 18 experience food insecurity. The numbers skyrocket in the North – with over half the children living in Nunavut lived in food insecure households and 7 of 10 Inuit preschoolers living in food insecure households. Canada remains the only G7 country without a national school food program and in 2017, a UNICEF report ranked Canada as 37th among 41 high income countries on the issue of access to nutritious food for children. The impact of childhood food insecurity is significant. Studies have found that food insecurity leads to chronic and long-term physical and mental health issues. 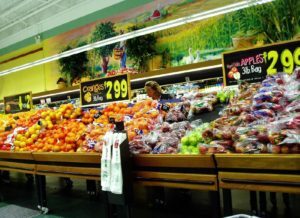 All over the country, food costs are outpacing wage growth – leaving many households unable to access enough food, let alone enough nutritious food. This is occurring in a country where the government has committed itself to realize the right to food. Canada made this commitment in 1976 by signing the International Covenant on Economic, Social and Cultural Rights, along with many other international instruments that recognize that importance of economic and social rights – for example, the Convention on the Rights of the Child. Without national leadership – including a national food policy that prioritizes food security in conjunction with a comprehensive national anti-poverty strategy, and a recognition of Canada’s obligation to create an environment where all people in Canada have their right to food realized – the new Canada Food Guide is little more than an unachievable aspiration. We need strong, rights-based policies at all levels of government so that healthy eating can be accessible for all. Right now, people in Canada are awaiting the release of Canada’s first national food policy, following the “What We Heard” report and policy consultation completed last year. Meanwhile, Canada’s food movement is mobilizing around calling for national leadership through the Food Policy, as well as through implementation of a national school food program. Let’s hope that this federal election, parties put food security high on the agenda – because without a commitment to realizing the right to food – documents like the Canada Food Guide will remain a distant conversation for people in poverty. Laura Neidhart is the Communications and Development Coordinator for Canada Without Poverty.